I've been working on this bag for a little while. It is my entry into the Craft Magazine "Sew Inspiring Amy Butler contest". Entries close later today NZ time. The design borrows ideas from a few other bags I've made over the past couple of months plus I also included a few new ideas such as the single strap and the tab with a magnetic snap to close it. The rules for the contest were that you had to make a bag either incorporating Amy Butler fabric or using an Amy Butler pattern. 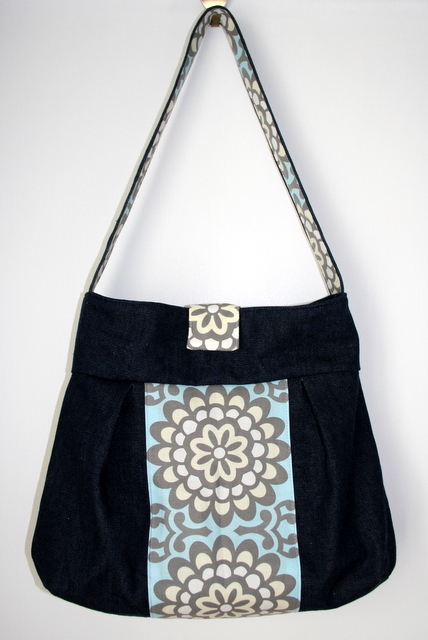 The main body of this bag is denim; the lining is a neutral coloured cotton. The feature fabric is Sky Wallflower by Amy Butler. 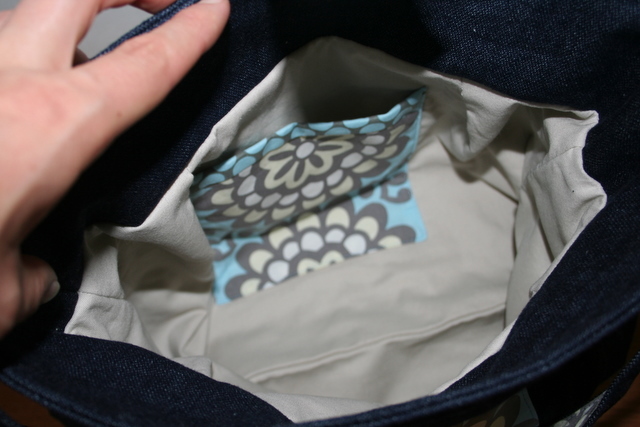 The internal pocket also uses the Wallflower fabric plus a small amount of Full Moon Polka Dots in Slate, also by Amy Butler. Both of these fabrics are from her Lotus collection. I'm quite pleased with how this bag turned out in the end. It went through a couple of design changes mid-construction, so I was a bit worried about the end result, but it all came together well I think. I'd like to make a few more tweaks to this design, but I think I will make a few more bags similar to this to open my Etsy shop with. I like it a lot! Good luck with the contest. What did you use for interfacing? I have the hardest time finding something that is strong enough to give shape but not o strong that it gives it those interfacing wrinkles. What a nice bag, I really love it. Lovely! I have been meaning to try the sewing bag thing. Good luck on the comp! Thank's for dropping by my blog and for the tip ;)yes I must try a pair of circs. for decreasing instead of dpns. Thanks for stopping by our blog, judging by yours, I think you will love our shop (if I do say so myself!) 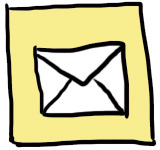 Your blog is lovely & I really like your banner.